The First Jam series was created to give children and beginners of all ages a book of simple, common tunes to learn. These are standard "Jam" tunes in the Bluegrass/Old Time music styles. All the books in this series are written in the same keys; they can all be played together without any problems. So get your friends or family who play guitar, fiddle, mandolin, banjo, ukulele, dulcimer or Dobro together, grab these books and start jamming. Improvisation – Another idea behind writing the First Jam series was to provide a number of tunes that were easy to learn, but that are also a great to begin working on improvising. 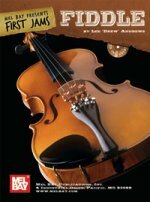 Each books offer the melody for that particular instrument as well as back-up chords for another instrument to accompany you. Each song is represented in notation with chord symbols. The accompanying CD has two tracks for each song. The first playing the song with the melody line, the second track offers just the backup so you can play the melody over it or even improvise. Tunes include: Cripple Creek, Old Joe Clark, Will the Circle Be Unbroken and many more. If any instrument needs a VISUAL LESSON, it's the FIDDLE! Although it's a lot of fun, the fiddle is more difficult in the beginning than any other instrument. This lesson is designed to start you off on the right foot, with hints that will make your progress FAST and PAINLESS! Download now from PlayBetterBluegrass.com! In nearly three hours of play-along instruction, Jim Wood teaches new fiddlers everything they'll need to play America's best-loved tunes. With the help of his wife Inge on guitar and second violin, Jim gives beginners pointers on bowing, accurate noting, and details on playing in several keys. Download now from PlayBetterBluegrass.com!